Straightaway, I was sucked into this book, in common with Alan Parks brilliant Bloody January which also plunges us into the moral and social cesspool of 1970s Glasgow. As an era defined by its suppression and mistreatment of the working class and the down at heel, whilst trying to gentrify and exploit society in equal measure. 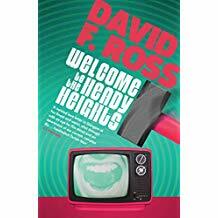 Although there is an unrelenting and brutal truthfulness to the city that Ross’ characters traverse, there is also an underlying feel of extreme pride and sympathy gravitating from Ross through his depiction of the city, the era, and his cast of misfortunates. In common with the great Irvine Welsh, life is grim, but there are moments of humour, epiphany and success that underscore the general downtrodden existence of Ross’ characters, and Archie Blunt in particular, most certainly getting closer to the gutter, being on the brink of losing his job, but coerced into the fakery of the world of light entertainment. The book is a real love letter to the 70s, peppered with cultural references, yes, I’m not a fan of Bohemian Rhapsody either, scaramouche my arse, and similarly to Benjamin Myers Turning Blue, homing in the world that came to light with the recent Yew Tree investigations. Equally, Ross shines an unflattering light on the rise of the corrupt businessman in the political world, and how dodgy contracts and oiled palms led to a generation of high rise building, heralded to those misfortunate to live in them as the best thing since sliced bread. This whole dirty whiff of corruption, be it police, financial, sexual, or otherwise permeates the story, and the threat of violence and retribution is never far from the surface. Ross has a real talent for characterisation, and I particularly enjoyed the stress and strain that he puts Archie through as the book progresses, revealing a tenacity and strength behind his somewhat timid exterior. As we see Archie getting sucked deeper and deeper into the murky waters of the Glasgow underworld, we are also become privy to a wide and interesting array of characters from both sides of the law. A tenacious female journalist on the trail of a corrupt businessman, Archie’s less than snowy white criminal associates, a group of dodgy lads aiming for the stars, and a resolute, although belittled female police officer palmed off with missing persons cases begins to see a cabal of depravity at work. 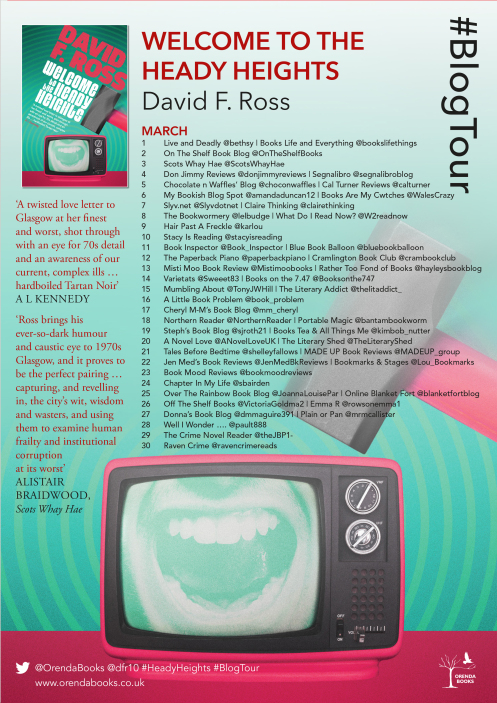 As I said, the book takes us to some very dark places, but within his cast of characters, Ross balances humour, pathos and retribution beautifully, with the Glasgow vernacular front and centre, and a resigned balance of optimism and pessimism amongst his protagonists, which adds to their realism and our reactions to them as readers. I loved the mordant wit, and the very defined sense of the goodies, the baddies, and the generally confused. Will definitely be tracking back to read Ross’ Disco Days Trilogy, as this book proved to be a wee twisted gem, giving this reader a very warm welcome to the Heady Heights. A thoroughly gritty, uncompromising and entertaining throwback to the 70s and totally recommended. Fearing a national panic over a copycat Ripper, Scotland Yard sends Inspector Ian Frey to investigate under the cover of a fake department specializing in the occult. However, Frey’s new boss – Detective ‘Nine-Nails’ McGray – actually believes in such nonsense. The plotting is superb throughout, suffused with all the familiar tropes of a traditional locked room mystery, with a good smattering of red herrings and false alleys along the way. I remained in blissful ignorance of how the crimes were committed until close before the end of the book, and enjoyed the air of ghostly goings-on, and twisting plot reveals that drove the action on throughout. My enjoyment of the book was further compounded by the brilliant characterisation of de Muriel’s ill-matched detective duo. He played them off against each other beautifully, pitting the uptight namby-pamby London detective, Frey against the rough, plain-speaking Scottish detective ‘Nine-Nails’ McGray. The ill tempered banter, and rivalry between the two was beautifully played throughout, even extending the north-south divide to their quibbling servants, and the way that they were perceived by the more well-to-do members of the cast in the course of their investigation. With de Muriel’s liberal use of the Scottish vernacular in the case of McGray, compared with the southern nicety of Frey, their voices rang loud in my head as I was reading, and I learnt some wonderfully earthy Scottish insults along the way! By depicting these two so colourfully throughout the book, there can be little doubt that this partnership will run and run, underscored by the resentment but grudging respect that defines their personal and professional relationship. So all in all a bit of a find this one, threaded with humour, intrigue, colourful characters, and a real sense of time and place. A very impressive debut, and I cannot await the further adventures of Frey and McGray. 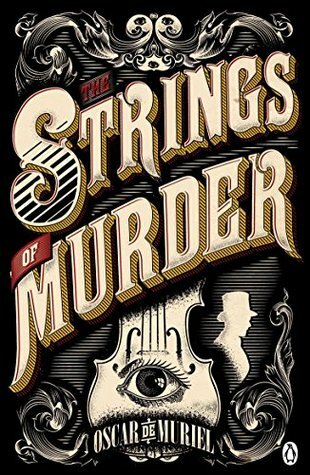 A cracking good read, and a case that Holmes himself would love to have flexed his detective skills with. “I was born in Mexico City in 1983, in the building that now houses Ripley’s Believe it or Not museum (some people claim to see a connection there…). I had a very happy childhood even though I did not try refried beans until I was six (I refused to eat anything brown and gooey). My first attempt at writing stories, aged seven, was a tale about a triceratops and a stegosaurus battling a very hungry T-Rex. Their three-page, ten-line long adventure was profusely illustrated by the author. Stegosaurus was extinct millions of years before the first T-Rex hatched, but I still consider it a milestone. When I was ten, Jurassic Park (the novel) scared the Jesus out of me – reminiscent of that Friends’ episode where Joey Tribiani hides his books in the fridge (I blogged about that here). I’d never thought that written stories could have such a thrilling effect, and as soon as I got JP out of the freezer I decided I wanted to become a writer. After a few fiascos and blatant steals, I managed to produce a few decent novels in various genres. However, I found myself particularly comfortable writing historical fiction. I came to the United Kingdom to complete a PhD in Chemistry, working as a free-lance translator to complement my earnings (I was responsible for some cool Johnnie Walker’s ads for Colombia). 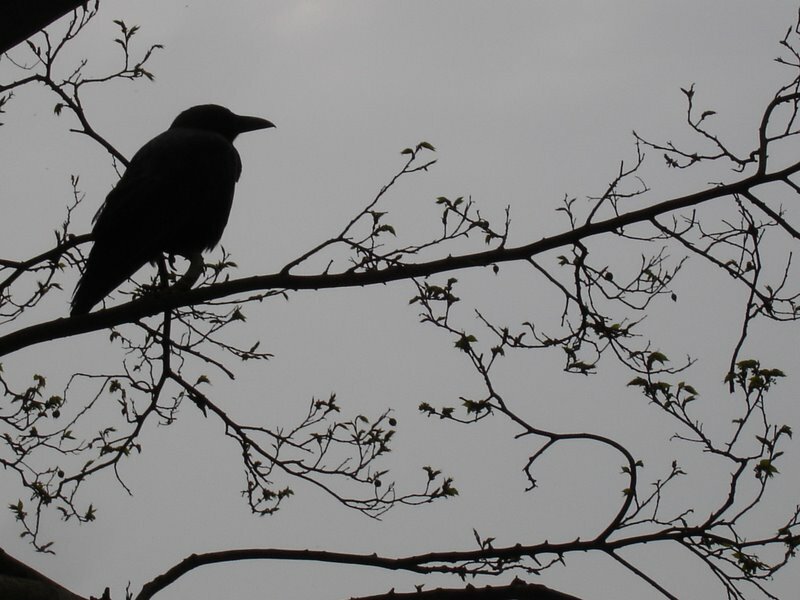 During this time I produced a handful of academic papers, and the idea of a spooky whodunit started to take roots in my head. After several visits to Edinburgh, the city struck me as the perfect setting for a crime mystery. The entire concept of Nine-Nails McGray came to my head while eating pizza with a couple of friends [guys, do you remember Cantina Los Perros and the sea monster?]. For years I’d been meaning to write a story about the Devil’s sonata (I am a violin player myself, which I should have probably mentioned earlier…) and it fit perfectly as McGray’s first case – hopefully the first of many. As much as it pains me to draw on the words of Forrest Gump, Peter May’s writing is like a box of chocolates- you never know what you’re going to get. From the brilliant Enzo Files series, to the China thrillers, to, the wonderful Hebridean trilogy, and the haunting standalone Entry Island, May consistently demonstrates his flexibility as a writer, instilling total belief in his characters and locations for us gentle readers. Runaway proves itself an excellent addition to his multifarious back catalogue, and drawing so closely on his own life experiences gives us a delightful insight into the background of one of Britain’s finest crime writers*. Working with a dual timeline of 1965 and 2015 the story pivots seamlessly between the two as we follow the travails of Jack Mackay, a headstrong seventeen year old in the Sixties, who succumbs to the allure of the bright lights of London, as he and his band (comprising of Maurie, Joe, Luke and my favourite character, Dave) run away from Scotland to seek their fame and fortune. May captures perfectly the impetuousness of youth, and their black and white view of the world, after a series of hapless accidents mar their dreams of fame. Into the mix, May inserts the womanly charms of Rachel, Maurie’s cousin who they liberate from a drug-fuelled abusive relationship along the way, a few interesting brushes with stardom, an encounter with a bizarre hippy therapy group, and a murder where all is not how it appears. With a backdrop of the swinging music scene of the era, and a perfect recreation of London itself, there is much to garner the reader’s interest. Now, zap forward to 2015, and Jack is a disillusioned pensioner lamenting a life where so much more could have happened, However, with the news of a suspicious death linked to his 60’s experience, and spurred on by the terminally ill Maurie, he and the remaining members of his band, up sticks to London with his grandson Ricky, to revisit the past and lay some old ghosts to rest but at what cost? And are some skeletons best to be left nestled in this particular cupboard? My overarching reaction to this book is one of warmth. I loved the poignancy attached to Jack and his cohorts in their twilight years, haunted by their failed dreams and ambitions, but undercut by a humour and determination of spirit that we so often ignore when we perceive people as old. Likewise, May totally taps into the irascibility and naivety of youth, in the 60’s timeline, and the exploits of this band of hotheads, and their emotional entanglements are powerfully wrought. To my mind, the actual crime element of this book was completely over-ridden by this strong characterisation and the examination of the impetuousness of youth, and the stoicism of age that so dominates the plot. Hence, this was a different reading experience, but one that I thoroughly enjoyed, manipulating my emotions from laughter to sadness, and all points in-between. I liked the utterly authentic recreation of the 1960’s, with its allusions to people, places and fashions, tempered by the relatively anodyne existence of our band of misfits in their later years. A welcome break from the usual crime fiction fare, and highly recommended.